Genesis 9:1-3: "God blessed Noah and his sons, and said to them: 'Be fruitful and multiply and fill the earth. The fear and dread of you shall rest on every animal of the earth, and on every bird of the air, on everything that creeps on the ground, and on all the fish in the sea; into your hand they are delivered. Every moving thing that lives shall be food for you; and just as I gave you the green plants, I give you everything." 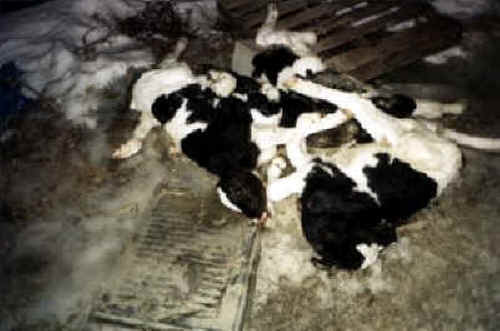 This is a dead pile of calves behind a veal farm. "For there is nothing inaccessible for death. All beings are fond of life, hate pain, like pleasure, shun destruction, like life, long to live. To all life is dear." Jain Acharanga Sutra.